Enjoy easy preparation and clean-up with a delightful Chicken Fricassee. 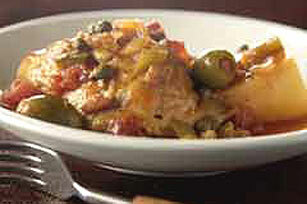 Use your Dutch oven to cook this delectable Chicken Fricassee dish. Cook onions, green peppers, bacon and garlic in Dutch oven on medium-high heat 2 min., stirring occasionally. Add chicken; cook 10 min., turning chicken occasionally. Add tomatoes with their liquid, the tomato sauce, wine, olives, bouillon, capers, oregano and black pepper; stir. Bring to boil; cover. Reduce heat to medium-low; simmer 20 min. Stir in potatoes; cover. Cook an additional 15 min. or until potatoes are tender and chicken is cooked through (180°F). Serve over hot cooked rice. Garnish with chopped fresh parsley. Prepare as directed, except do not add the potatoes. Cover and refrigerate up to 24 hours. When ready to serve, add the potatoes and bring mixture to boil on medium-high heat. Reduce heat to low; simmer until the potatoes are tender and mixture is heated through, stirring occasionally.